and brush. (Google Maps 2015). Welcome back. About a year ago, in a blog post about my new life in the Wisconsin hinterlands, I suggested one possible cause for the relative dearth of local wildlife encounters was the lack of contiguous cover (Settled In). 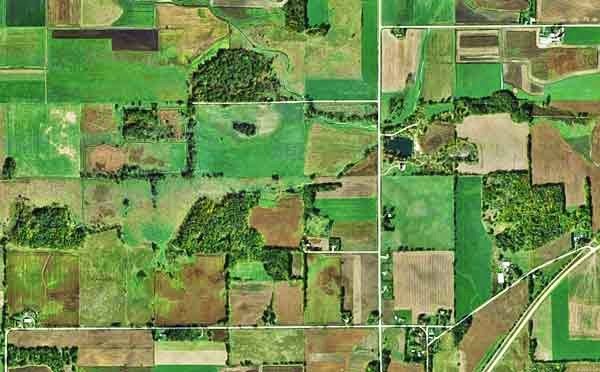 Although there are trees and brush along many roads and around some houses or fields, for the most part, those stands are separated from one another by land that is farmed or cleared for other purposes, including housing. 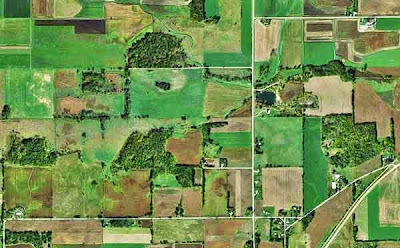 I haven’t dug into the history of land cover in Wisconsin or this area in particular, but I’d feel safe filing it under habitat fragmentation, which describes the division of larger, continuous habitats into smaller, more isolated remnants or patches. And you should care, why? Because a recent study of global habitat fragmentation by 24 collaborating scientists from 19 academic or research institutions in 6 countries, led by North Carolina State University, provided clear evidence of the negative impacts of habitat fragmentation on biodiversity and ecological processes. Combining that with their assessment of global forest fragmentation, they found, well, we’re not winning any prizes for global stewardship. 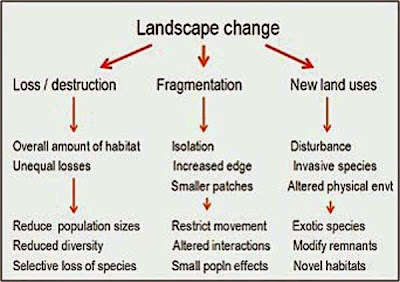 No one doubts that habitat destruction has a negative impact on biodiversity, yet there is disagreement regarding the extent to which fragmentation itself is to blame. Do fragment size and isolation have a role in biodiversity decline and ecosystem degradation? To address that question, the investigators synthesized the findings to date of the world’s largest terrestrial fragmentation experiments--experiments running as long as 35 years and being conducted in disparate biomes on five continents. Drawing upon experimental findings instead of observational studies was done to take advantage of the control provided by experimental replication, randomization and baseline data in separating the effects of fragmentation from those of associated habitat loss and degradation. Each experiment was designed to manipulate specific components of fragmentation--habitat size, isolation, and connectivity--while controlling for confounding factors. Together, the experiments show fragmentation causes loss of plants and animals, changes how ecosystems function, and reduces the amounts of nutrients retained and the amount of carbon sequestered among other deleterious effects. Of note is that losses of biodiversity and ecosystem functioning are continuing two decades or longer after fragmentation actually occurred. Understanding the relationship between transient and long-term dynamics is a challenge. To highlight habitat fragmentation of one ecosystem type, forest, the investigators analyzed a high-resolution map of global tree cover developed earlier from satellite image data (see P.S.). The fragmentation analysis found that over 70% of the world’s remaining forests are within 1 kilometer (0.6 mile) of a forest edge, well within the distance of being impacted by human activities, altered microclimate and non-forest species. Moreover nearly 20% of the world’s forest is within 100 meters of an edge (about the length of an American football field)--in close proximity to agricultural, urban, or other modified environments where impacts on forest ecosystems are most severe. 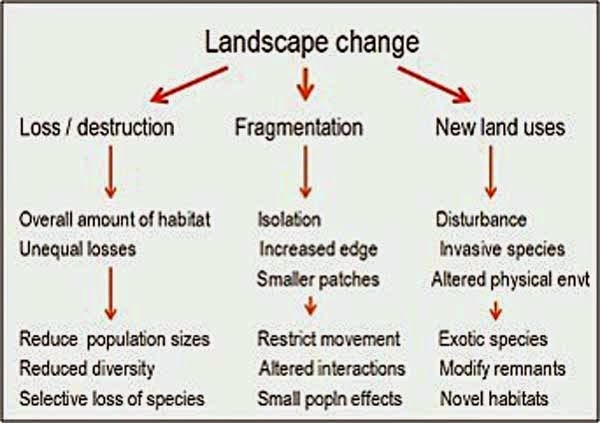 While the obvious solution to mitigating the negative effects of fragmentation is to conserve larger habitat areas, the investigators recommend new experiments to better understand the dynamics of ecological and social systems for improved land management in fragmented landscapes. 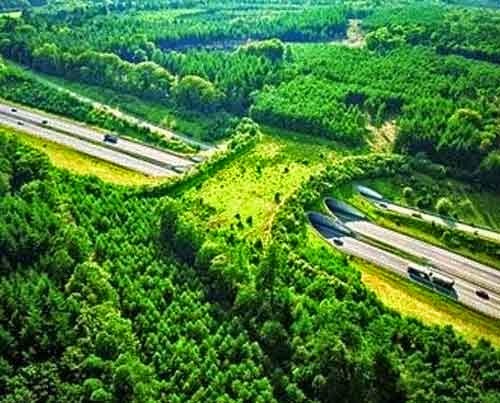 Other studies have shown the use of landscape or wildlife corridors to connect fragments can be effective. And most recently, supply chain intervention in the Brazilian Amazon has shown promise for reducing deforestation as more multinational companies agree to stop sourcing from farms with recent forest clearing. Somehow it just seems reversed that I should encounter more wildlife on the streets and front lawns in the suburbs of northern Virginia than in the wide open farmlands of Wisconsin. Thanks for stopping by.